He thought he would never be the same after his father’s death. Today, this 20-year-old singer is using his music to bring hope to people affected by suicide and addiction. WINCHESTER, Va. — Logan Smith’s brother, Cory, interrupted Logan’s late-night video game session in 2016 with news that would change both of their lives. Their father, Lynn, had taken his own life. “I didn’t know what to say, so I didn’t say anything. I was in shock,” Logan said. From that moment on, Logan was abruptly forced to rebuild a life without his father. It was hard on the entire family but Logan, a budding singer and pianist, felt his father’s loss particularly deeply — the two had forged a special bond through making music. His father was his first teacher and bandmate. Lynn had struggled with addiction. He fought alcoholism on and off throughout Logan’s life, which led to a cyclical pattern of fracturing relationships and rebuilding them. But it hadn’t always been a struggle. There were times when his dad was sober, years when the music flowed and the booze didn’t. Logan’s family would gather around decorated cakes to celebrate these sobriety anniversaries. But then tragedy struck when Lynn lost both his parents and brother one after another. Their deaths, coupled with an unfulfilling job, were hard on Lynn. Logan thinks it contributed to his dad falling back into addiction. “It was a really, really hard time for me and my family,” Logan said. Thrust into a cold, new reality, Logan had to navigate conversations about his dad with other people, and it wasn’t easy. He sought counseling to deal with emotions of his own as he mourned. Not only had he lost his dad, he had also lost his most trusted musical adviser just as his own career was budding. Despite the weight of his loss, Logan kept honing his musical prowess and writing songs while pursuing a music degree at Shenandoah University in Virginia. School was difficult for him, though, and it didn’t feel like the right fit for his aspirations. Logan was struggling to define himself as an artist when he sat down at a piano, overcome with longing for his father’s trusted advice. Then, the lyrics came to him—a ballad for his dad. The result was a song called “What If You Had Stayed,” which reflected on his father’s reaction to his music. “'What If You Had Stayed’” is about, ‘How do I still connect with him after he’s gone?’” Logan said. “All the music that I’ve made, there’s parts of him in there somewhere,” he said. Eventually, Logan decided to drop out of college to pursue music full time. He released “What If You Had Stayed” as a single in 2018, following his album “What If,” a soulful blend of gospel, pop, and rock. The young musician found singing made it easier to talk about his dad. He began sharing about Lynn at shows and found audience members were moved. Today, he tells his story with composure and honesty, something he thought would never be possible. As he makes a name for himself in the music industry, Logan has a mission: to destigmatize suicide and addiction. “I want to steer away from being like, ‘Oh, I want to be famous,’ or ‘I want to win a lot of awards.’ Those things would be nice, but my main goal or hope is that my music would propel me to a place where I can talk about these things to more people,” he said. Today, Logan and his band have completed their first tour and plan to embark on a second this spring. Wherever he performs, one thing is certain—his dad is cheering him on in the stands. 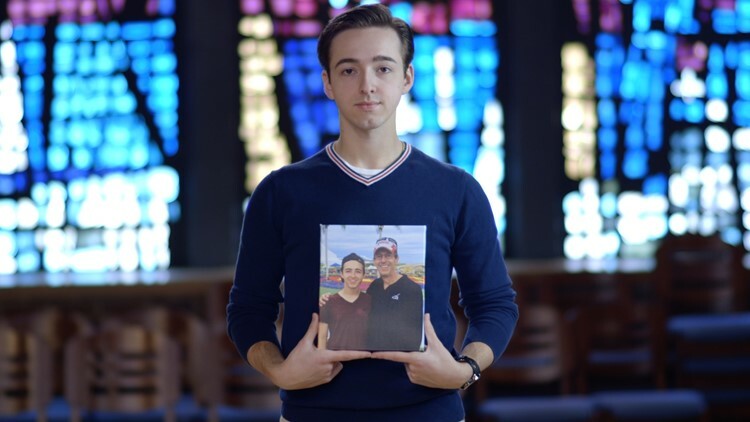 Musician Logan Smith holds a photo of him and his father Lynn. Lynn died in 2016. "When I used to perform when I was a kid, during the applause he would always be the first one to stand up and he would always yell, 'That's my boy!' and I was so mad at him for it, I would get so embarrassed... but yeah, he's probably saying that same thing now," Logan said. Listen to Logan’s other music here.